Do you sometimes feel indifferent to the problems people experience? A lack of concern for those in financial difficulty or who are ill or infirm? Perhaps you want to become someone with more warm-heartedness. To find more sympathy for the plight of others. Kindness is more than empathy. It is the desire to alleviate another’s suffering. It is ‘feeling for another’ and not just ‘feeling as another.’ It involves allowing ourselves to be moved by discomfort and wanting to help alleviate and prevent it. But kindness doesn’t seem to come naturally to some of us. Where are we going wrong? What is hindering us from becoming more sympathetic? One block to learning kindness is not being kind to ourself. Without self-care how can we expect to become caring towards others? Solely caring for those in need leads to compassion fatigue unless we look after ourselves as well. 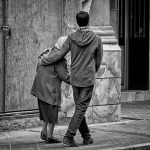 One way to start to find self-kindness is to bring to mind a memory of a time when someone was kind to you. Focus on the kind things this person said and the warm tone of their voice. If someone else can show concern about one’s own basic needs for bodily comfort, respect, and support, then why can’t one do this for oneself too? Kindness is having a sensitive emotional response to hardship and troubles. But things of the head also come into kindness. It involves sound judgment e.g. taking the trouble to understand someone’s predicament without blaming them out of hand for the trouble they are in. In the book City of Love we read of Stephan Kovalski who dedicated his life to caring for the people in abject poverty. His vocation was born out of his revolt against injustice and out of the ideas of social sharing and fairness in which he had been brought up. We cannot expect to feel kindly towards strangers if we don’t practice kindness towards our own friends and family. Why not try to bring to mind someone you care about (e.g. a partner, friend, parent or child) and practise thinking kind thoughts about them e.g. wishing them well, and happy and free from troubles. Avoiding the difficulties of others. The more we cut ourselves off from others, then the less we are aware of their personal needs. In contrast, engaging with their lives we gain familiarity with their predicament. In this way we give ourselves the chance of having empathy. Without understanding their feelings how could we sympathise? Without a good knowledge of what is going on for them, we are more likely to jump to the conclusion that their problems are self-inflicted. As clinical psychologist Paul Gilbert has pointed out, if you want to be a musician, practice playing an instrument; or if you want to be a good driver, practice driving. Not acting in a kind way is a block to starting to feel kindness inside. So we could try to do one act of kindness for somebody else each day – even if we don’t feel like it. You might say ‘but if I don’t feel kind-hearted then my kind behaviour is not genuine’. However, we can gradually learn to genuinely feel more sympathy by acting in a sympathetic manner. It’s like regular physical exercise. Doing it, even when we don’t want to, will still get us fit. And when we do act kindly the person is likely to be appreciative. I find it easier to acquire sympathy for others who are friendly towards me. From a spiritual perspective, a block to learning kindness is the limits of self-reliance. Alchemists in the middle ages found the limits of their ability to turn base metals into gold. They have made moral and philosophical interpretations. These suggest that they were aware of the symbolic meaning of their art in terms of human transformation. Some realised they needed to make personal changes in order to gain deeper understanding. This meant renouncing envy, attachment to pride and egoism and self-preoccupation. Instead they sought a higher power through meditation and prayer to gain an attitude of kindness to others. Religion sees this personal transformation in terms of salvation. Sometimes apparently religious people seem to be preoccupied with their own personal salvation for the sake of their own happiness. They feel indifference to social inequality and injustice. They remind us of the Pharisee who – unlike the good Samaritan – lacked compassion towards the injured man. The non-religious can also be prone to a self-righteous attitude. According to the Hindoo word daya, compassion is feeling one with the sufferer. It is differentiated from kripa which means pity with condescension. It doesn’t help to become kind if we ignore inspiring role-models. Those who have read many of the Buddhist scriptures are left with the impression of a very great personality. One who perfectly combines calm reason with boundless sympathy and compassion. Many Japanese Buddhists think of Amida. This is the enormously popular Buddha of Infinite Light. They often see him as nothing more than a name of the Absolute. Yet they still find the beloved image of this compassionate deity to be an invaluable aid in their spiritual lives. Christians see Jesus as showing loving kindness to those his society had condemned – tax collectors, prostitutes and criminals. They see the death of Christ as an act of loving self-sacrifice out of compassion for others. An exemplar of love with whom they feel drawn into sympathetic association. I believe that if we can overcome some of these blocks, then we will begin to learn sympathy, kindness and compassion. Sympathy – Can I feel more warmth to others? Previous Previous post: Bereavement – What to say? Next Next post: Fear of death – how to beat it?